When a boy goes missing on Whidbey Island, it’s expected that he’s hiding out at the Gray’s house. But Grant isn’t there. Pixie is one of the Gray quintuplets, large kids who seem to have special talents. When Pixie heads out with her scent dog, the best in the state, to find Grant, she discovers something else instead – the body of his mother. Henry, Grant’s half brother, is also part of the search. He knows the attention and problems that come with living in a very wealthy family. His family has staff that travel with them, and it could have been any of them who took Grant and killed his mother. Through the ensuing search, secrets are exposed and powers are discovered in this teen book filled with magical realism. This book is great fun to read. One never quite knows when something mythical and amazing is going to suddenly happen. Those are mixed in with more mundane happenings like murder and kidnapping to create quite the setting for mayhem. Still, there is a feeling of truth through it all, of teens rising up through difficulty to heroism. There is a sense of fate and of purpose too, of destiny combined with the wonder of magic and myth. The writing is strong and direct. It is haunted with death and pays homage to the damage of abuse and the strength of family. This book is not simple or easy, it is strung with danger and traps. The entire feel of suspense and the claustrophobic island setting combine to create a feeling of doom laced beautifully with hope and love. A teen novel that is a compelling and vastly enjoyable read, this is a winner. Appropriate for ages 12-14. My heart just soared! 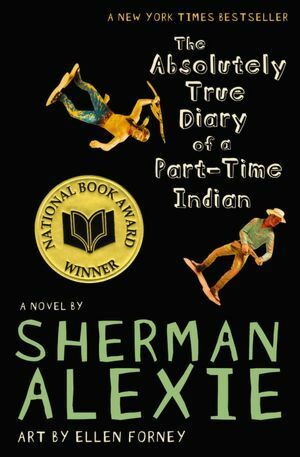 The Hollywood Reporter has the news that The Absolutely True Diary of a Part-Time Indian by Sherman Alexie will be made into a film. Even better, Alexie himself will be adapting the screenplay. Hugh Jackman will be playing a supporting role and serve as a producer. Temple Hill, who also produced The Fault in Our Stars will be producing as well.